La Sita Stables is a small family ranch located in southwest Bexar county in Atascosa / Macdona Texas, greater San Antonio area. Our facility is primarily interested in family oriented recreation and safe horsemanship. Our goal is to promote clean healthy family fun. Horse lovers of all ages are welcome at La Sita. Our stable family includes novice children and adults, competitive junior riders, and some adults who simply enjoy trail riding. We are a self-care and self-feed facility that offers it’s boarders a wide array of amenities to allow owners to care for their horses and stables to board them. We warmly welcome all breeds and riding disciplines. We provide boarding with covered Stables, private tack rooms, a horse-walk and turnout areas. For year round riding and training our other amenities include a large open outside arena with barrels and poles, a lighted round pin, two 6-horse electronic horse walkers, horse-wash, and family picnic/B.B.Q area. We also list area vet and farrier services that are available. Our grounds and services provide a safe and friendly environment for both horse and rider. We have Stables for Rent! Coming in for Rodeo, need a place for your horse? We have Stalls available. San Antonio Rodeo Horse Boarding. 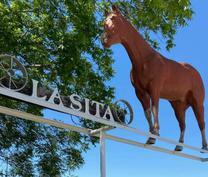 La Sita Stables is a top San Antonio, TX horse boarding farm on NewHorse.com!